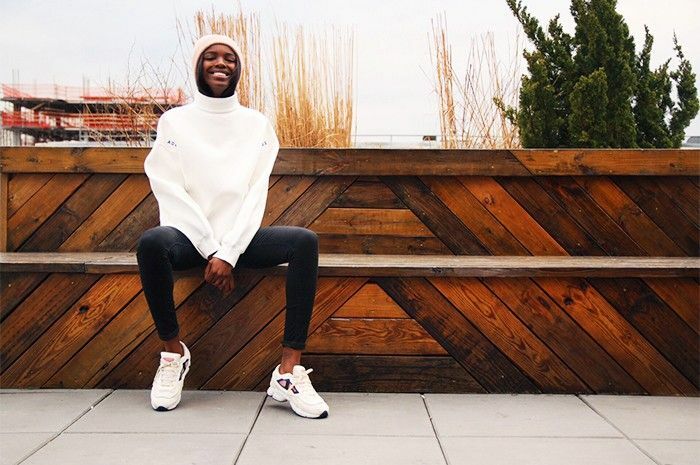 London girl Leomie Anderson is not only a highly sought-after model—from high fashion runways to lookbooks galore and a very coveted spot on the Victoria's Secret show—but she's one of the biggest sneaker freaks we know. She has a collection to rival anyone's and knows rare kicks and the newest launches like the back of her hands. She'll document her love for trainers alongside other fashion news, outfits and behind-the-scenes snaps on her style blog, Cracked China Cup, but today she's sharing her spring sneaker run-down with Who What Wear UK exclusively. "The Ozweego 2 is my favourite style from the sought after Adidas by Raf Simons collaboration, because although it's chunky, it has a really refined and clean look to it. I waited patiently for this particular colour-way to drop and even ordered the wrong size the first time round in my rush to cop before they sold out but it was worth it as they can be worn with literally anything from denim to a tracksuit." "I've been a big fan of Billionaires Boys Club since MTV rinsed Pharrell's 'Frontin' ' so felt I owed it to myself to get a pair of the latest BBC x Stan Smith collaboration. They come in a printed pony hair fabric that really caught my attention, and coupled with the bright gum sole they add an unusual quirk to my collection." Adidas Pharrell Williams Billionaire Boys Club Stan Smith Pony Hair Sneakers (£145). "Going bold and bright with your trainer choice can bring so much life to an outfit. I love the Nikelab Air Force 1 Ultra Flyknit that my boyfriend surprised me with, because they are playful and add character to an all black outfit." Nike Air Force Ultra 1 Flyknit (£150). "Rihanna is literally my style idol so of course her Puma by Rihanna creepers are one of my favourite pairs of kicks. I feel like they're the perfect day-to-night transitional trainer—I even wore them when I was on the Victoria's Secret Live talk show (the first girl to wear kicks!) but they look equally as good with a pair of ripped jeans." Puma by Rihanna Creeper (£85). "These Balenciagas are really significant to a memorable time in fashion when Alexander Wang took over the helm of Balenciaga. These were one of the first kicks to come from the fashion house, and I feel they have his signature all over them. I love wearing these in summer with a simple denim shorts and T-shirt combination." Shop for more sneakers here and be sure to check out Leomie's latest on her blog, Twitter and Instagram! Leomie Anderson is with Premier Model Management.